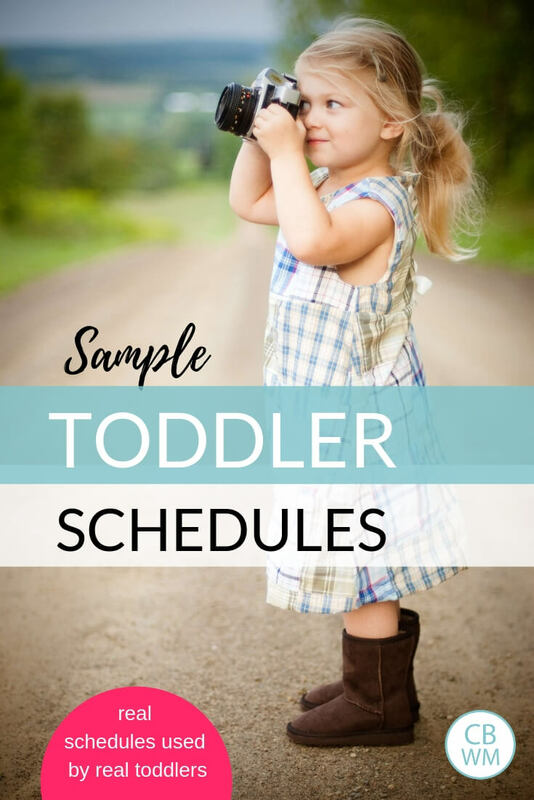 Toddler schedules. 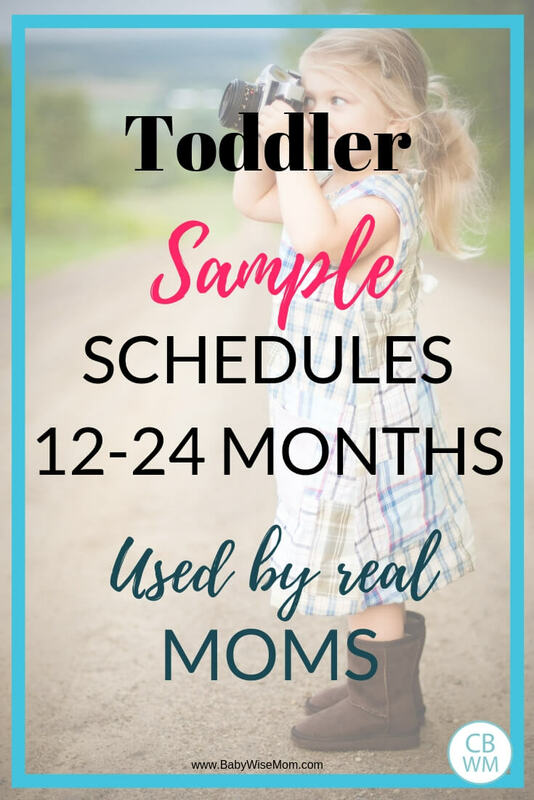 Sample schedules for 12-24 month old toddlers used by real moms. 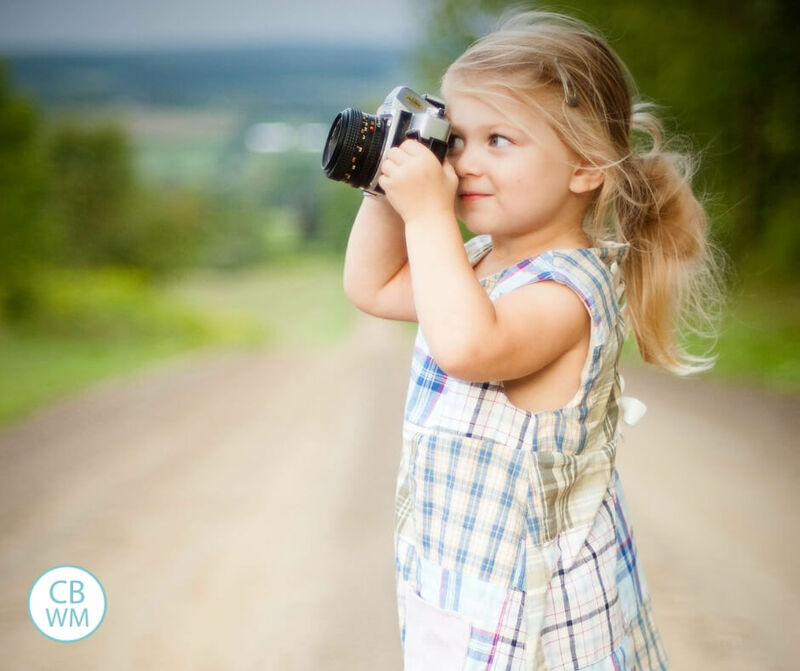 Helpful schedule ideas for toddler moms. 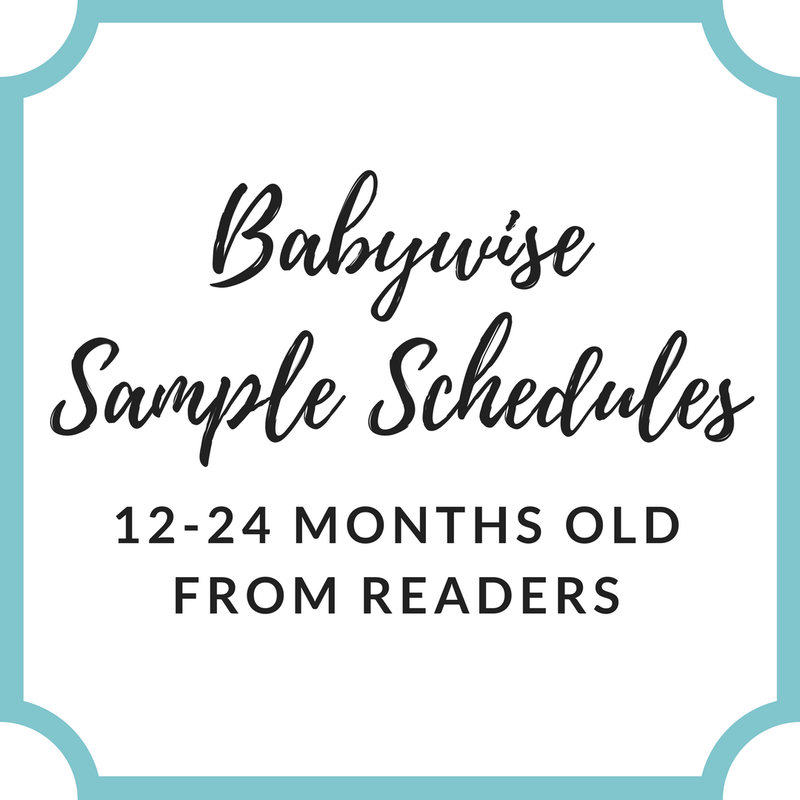 Comment on this post to add your individual children’s sample schedules, ages 12-24 months. Please include the age for the sample schedule. As you comment, I will organize the sample schedules into the main body of this post. Add them for any age; you don’t have to do all of them. 12:00 Wake, nurse if she’ll sit still for 1 minute! 7ish Play with Dad! Her favorite time of the day! 8-8:30ish Bedtime. Read books, hugs for everyone, snuggle for a minute, then lay down & lights out. 8:30 – At Babysitters — playing!! 4:30 – Pick up my princess!! 7am Wake, breakfast, and free play while I make my husband and myself breakfast. She has finger foods while we eat and then “helps” me clean up the kitchen. 8:30am Help me start laundry, brush teeth, get dressed and play quietly until naptime. 15 Months- Girl- this has been our schedule since she was 8 months old! It has been so nice to have the consistency! This is our Routine Monday-Friday. My Little one is 15 months now. We have been on this routine since about 12 months. If wakes before 6:30, she is left in bed until 6:45 (7:00 if still happy). 9-10:30am – Free play, read, play in the backyard, help mom vaccuum :), etc. 2-5pm – Run errands or activity like going for a walk, go to the pool, park, play date, etc. 7:00-7:30 wake and play in crib till daddy comes in around 7:30. 7 oz. milk in bed with mommy while she is waking up. Certain days we go to the gym, dance class, a friends house, or mommy is picking up the house. Half hour or so after she wakes she eats a snack. I was giving it right away but she stopped taking it, so I waited a bit till she woke up more. Mondays and Wednesdays we do swim lessons in the pm. Other days we run out to get her out of the house in a cool environment during the summer. Too hot outside at this time of day. After writing this out and looking over her schedule, I see there are a lot of open gaps with too much playtime in there. I think she really needs a lot more structure than I’m giving her. 9:15am Playtime with mom/also helping with laundry! 9:15-10:30 nap 2-3 days of the week or sometime in the morning we will go to storytime, playgroup, the park, or church. Still in the process of dropping this nap. Free play or activities with mom after nap/morning activity. 7:30pm Read some books and into bed! Play inside or outside. Some days 20 min of Elmo. 5p-Diaper change. Free play while Mom preps dinner or playtime at the KidZone at the Y while Mom works out. 6:15pm-Dinner with mom and dad. 7:15-7:45p-Bath on bathnights, get jammies on, read books. 7:45 bed (Lately won’t fall asleep until 8:30 due to summer I think but it’s been very frustrating. I’m in the process of troubleshooting). Thank you everyone for adding your sample schedules!I have added them to the body of the post and will now be deleting your comments.Readers are still welcome to add sample schedules! Thank you everyone for all of your sample schedules! I have put them into the post. Thanks! Becky, I think I would do breakfast and then milk. At 12 months, I actually gave it at basically the same time, so you could do that. I would probably do family breakfast, then bottle during the drive if it is close enough to breakfast time. Help me Val! I've read every sample schedule I can get my hands on for a 1-nap baby, and we don't seem to fit any of them. My daughter is 13.5 months and 2 weeks ago dropped to 1 nap. I feel very sure she made this drop on her own and we're at 1 nap for good; there was no transition time or effort on my part; she just stopped sleeping at the 2nd nap (which had been about 4-5:30pm) cold turkey. She goes to bed about 9pm, wakes around 8am (I know a late bedtime is frowned upon, but the late bedtime means a later waketime and since I'm pregnant with #2 and sleep best in the morning, I haven't wanted to push up bedtime and therefore waketime). She gets sleepy by 11:30 or 12pm most days, so I am for no later than a 12:30 start time to the nap; sometimes it begins as early as 11:30am. She usually only takes 10ish minutes to fall asleep, but raaaaarely makes it past 90 minutes of naptime (sometimes only 60 minutes). She then wakes up cranky and becomes woefully cranky around 5pm each day. Twice I've tried putting her down for a short 2nd nap to make it to the late bedtime to no avail. Today I left her for 2 hours after she woke to make sure she wasn't going to fall back to sleep- no luck. She simply won't nap a second time, so we're just stuck with a cranky baby all evening. Three times since starting a 1-nap routine has she had a 2.5+ hour nap, so I know she's capable, but those days weren't aberrant from the rest so I don't know why they were randomly good ones.I know we haven't been doing 1 nap for all that long yet, but I feel certain she can't get by on just 1.5 hours of daytime sleep, right? And I'm going crazy. How on earth do I get a consistent 2+ hour nap? Do I stretch pre-nap wake time? Put her to bed super early (like 7:30? I don't see her making it to 8am with an early bedtime, and won't an earlier wake time require an earlier nap start time and perpetuate the need to go to bed earlier, then wake earlier, so we can never establish a schedule?) Do I just wait it out and pray that after another week or two she adjusts and takes a longer nap? Sunk Costs,So on a one nap schedule, you should have at least a two hour nap, but most will sleep around 3, some even four hours. My guess is she needs to go down for her first nap a little earlier than she is going down and then still have another nap. Since sh is waking at 8, she should be able to make it until at least noon if she is really ready for a one nap a day thing. Most babies her age who are ready for not always having a second nap do the one nap some days, two other days. It is a weaning process rather than a dropping. At this point, if she isn't napping well still, I would look into an earlier nap with adding a second nap in, also. Good luck! My daughter is almost 19 months old and has been on one nap for a while now. I can't get her to nap for more than 2 hours. She wakes up by 2:30 maybe 2:45 no matter what time I put her down so she can never make it to her bedtime of 7:30 without getting overtired. I need help tweaking her schedule. How do I get to a longer naptime? WORKING PARENTS4 months – 3.5 hour schedule 6:30 am Wake Feed Play8:00 am nap time9:30 am Wake Feed Play11:00 am nap time 12:30 pm Wake Feed Play2:30 pm nap time4:00 pm Wake Feed Play6:00 pm Nap time7:30 pm Wake Feed Bath8:30 pm Bed timeWe have adjusted to fit what works best with out LO. Obviously, every baby is different and may require more or less nap time then ours but this has worked wonders for us. He is up with us when we have to get ready for work and his schedule is perfect for our afternoon of getting home from work, cooking dinner and having quality time with him before we all go to bed for the night. 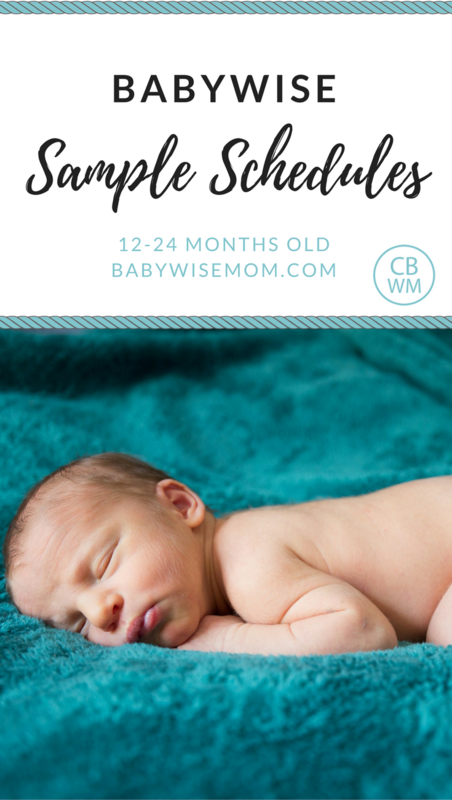 I swear by baby wise and have recommended it to all of my parent friends. thetam, have you tried an earlier nap time? Also, is there something happening at that time that could be waking baby up? A certain noise? The way the sun hits his room? 17 Months Old:8:30 Wake Up, Change Diaper, Breakfast and watch Sesame Street9:30 Swimming/Play!11:00 Lunch11:30 Bath12:00 Bottle and Nap4:00 Wake Up, Change Diaper, Eat SnackPlay!6:30 Dinner7:45 Get ready for bed8:00 Bottle and BedSleep through the night. 17 Month Old – Boy7AM – DWT9:30/45AM – Nap time (takes at least 30 minutes to fall asleep)11AM – Wake Him2:00PM – Nap time (takes 30 minutes to 1 hour to fall asleep)4:30PM – Wake Him8:00PM – BedtimeI think we almost ready to transition to ONE NAP! 15 month old boy 7:15 wake up and out of crib9:45 nap10:45 wake from nap2:15 nap4:15 wake from nap 7:30 bed About once/twice a week he skips a nap and has slowly been shortening his morning nap. I think in another month or so we will be down to one nap. 15 MO girl7:30 wake, drink milk, breakfast with mom8:30 roomtime while mom gets ready9-10:15 free play, helping mom clean up, reading books10:15-11:15 nap11:30 lunch with water12-2:15 take a walk, playdates, run errands-out of the house2:15 nap3:45 wake, cuddle, milk, structured activity while mom cooks dinner5:00 dinner, dad gets home, then family time7:30 milk, bath, books, brush teeth8:00 bedtimeShe has never been a very good napper, and will only sleep 11.5 hours at night, but this seems to work for us! I also should mention that our twins nap in different rooms. Our daughter doesn't take as long of a nap as our son does. 18 Month Old Boy6.30-7 wakes up and plays in crib until he hears daddys alarm at 7.7.00 get up, nappy change, get dressed, play in sisters room while we get her dressed7.30 breakfast8.00 free play with older sister and mummy8.30 Has his milk in highchair, then clean teeth and wash face, do hair8.45 Go to nursery 3 mornings a week or if at home read books with mummy9.00 Tv time or free play9.20 Small snack9.30 Various activities – walk outside, park, playdate,errands, music class, library11.30 Lunch/ free play12.00 milk /nappy change12.30 nap3.30 awake/ milk/ read books with mummy4.00 free play/ or music time with mummy/ or sibling play in room4.30 outside activity- kick ball etc or table activity in highchair5.00-free play5.20 Dinner 5.45 Read books in highchair – I set timer for 9 mins and he is happy to do this6.00 Tidy house together and then watch christian childrens dvd 25 min/ or daddy time if home/or bath6.30 bedtime routine7.00 in bed I would like to do independent playtime with him also. That is my goal for the next few months. Not sure on a time yet though. Hi! I'm am totally at a loss right now with my daughters schedule and I would love some advice!! She just turned 17 months and I think we are transitioning to one nap. However she has all of the sudden been waking up anywhere from 5-6:30 in the morning!! Obviously this is way too early but I can't figure out the problem! If I give her a nap in the morning around 9/9:30 I'll have to wake her at 11 and then she hasn't been falling asleep in the afternoon. I usually try and put her down around 2 pm. So then she's been up from 11 am -7pm. When she wakes this early she can't make it until afternoon nap. I would love some suggestions to know where to start!! Thank you in advance! 15 month old girl:7am – wake (sometimes as early as 6, sometimes as late at 8)8/8:30am – breakfast (cereal with fruit or toast)9am – play on her own9:30 – outing to the park with Dad, sometimes to kids activities in the area/library/gym11:30 – return from outing12pm – lunch12:30/1:30pm – nap… varies a lot2:30/3pm – wake (usually 1h 45m – 2h 15m nap)3pm-4pm – play time indoors with mum4pm – some days a swim or kids activity at the gym6pm – dinner7pm – bath time7:30/8pm – books and bottle8/8:30pm falls asleep here somewhereIs this enough nap time??? She doesn't seem to need 2 naps anymore..?? ?